THE perspective illustrated here [right] shows the new State Library, Pretoria, as it will appear when, completed. The block is on the corner of Andries and Vermeulen Streets, the entrance facing east. At the inception of the scheme the intention was to spread the building programme of four contracts over a period of about 10 years, each contract to be put in hand as funds became available. The first portion of the Library was completed and handed over for occupation on July 30, 1937. This portion is shown in the sketch as the right-hand wing, up to the cornice, flanking the entrance portico. 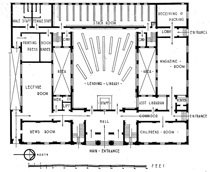 It comprises the Children's Room and Magazine Room block shown on the right of the plan. The total cost of this portion, including furniture and steel shelving, was approximately £1,250 (2,500R). The attic floor is to be added later. Unfortunately, although the working drawings of the 1940 section comprising the Stack Room block (see plan) are complete, construction has had to be postponed owing to the war. The style of the building may be said to be South African Dutch, the broad simple lines of which give this building a dignity and character of restfulness suitable to its function. Red granite, from Leeufontein, 20 miles (32km) east of Pretoria, forms the plinth Externally, the building is to be finished entirely of plaster, with all exposed Windows and shutters of hardwood painted white. In the portico the main entrance doors, with curved fanlights above, are to be of oiled teak. Further details are not necessary at this stage as the plan and perspective are sufficiently clear. The building was designed by the Union Public Works Department, Pretoria.